I’ve had a lot of problems getting the curtain/shade/blind (I hate the term “window treatment”—it makes me think of a gigantic box valance) situation in our house where it should be. Six-inch casings, non-standard sizes, 10′ ceilings, and curved walls with side-by-side windows make everything a challenge. The cost of custom-made shades freaks me out, and with 14 windows, it’s just not going to happen. I love the way the old windows look without anything covering them, but that’s not practical in every room of the house. In the office at the back of the house, there’s no need for privacy, but the “reflective black hole” effect at night is a little creepy. Enter the ENJE roller blind from IKEA. $24.99, attractive metal hardware, sheer enough to allow full daylight to pass through, opaque enough to keep glare (and the black hole) away, and with a margin large enough that the window sashes show on all four sides even with the blind fully closed. Yay! Let’s buy a hundred of them! Perfect, yes, except for the part where they come in five sizes, none of which will fit any of our windows. Sigh. BUT WAIT!!! A little Googling showed me that not only can they be trimmed, but they look really good after doing so. Aided with a metal blade in the jigsaw, good-quality fabric shears, a straight edge, and some good advice from Morgan at The Brick House, I was able to alter two shades to fit my windows perfectly, and it only took about 30 minutes. See? They even let in the scraps of daylight hanging around at dusk. I wound up cutting the top roller and bottom rod separately (I removed it first), then verrrrry carefully cutting the fabric the full length of the shade. I cannot stress enough the importance of using a good quality pair of shears to do this! Hopefully you have scissors in your house reserved exclusively for cutting fabric. And you NEVER EVER cut paper or anything else with them. Right? Right. That’s what you should use to cut the shade. Not the grimy Fiskars in your junk drawer. Cut slooooowly and evenly, following the line you drew in ever-so-faintly with a hard pencil after measuring carefully. Slide the bottom rod back on, roll up, and you’re all set. 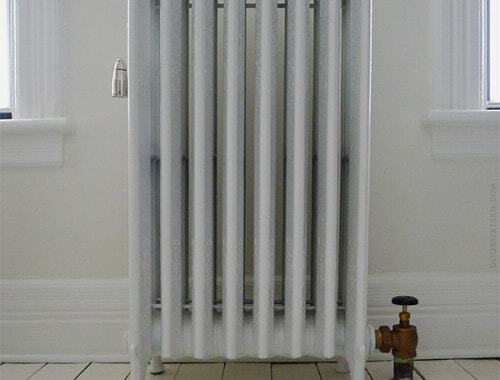 Refinishing cast iron radiators, big budget edition. beautiful! that’s not an easy task. looks great. It was actually really simple! Using a jigsaw to cut the metal rods makes the whole thing take 15 minutes per shade, tops. The most time-consuming part was measuring/marking the cut line. I’m not sure I could survive without an IKEA an hour away. You have my sympathies! i posted the original question on ikeafans that you referenced! i never got around to shortening them, though. is this the internet’s way of reminding me that i’ve been putting it off for almost two years(!)? surely it’s a sign that i have to do it this weekend. would you mind sharing the extra tips that you were given? my two favorite bloggers! double yay! Ikea is endlessly useful for those with a need to customize on a budget. Maya, your my favorite person. The blinds look fantastic! I’m completely with you on ‘window treatments’ and scary black holes at night! Another solution to the ‘black hole effect’ is landscape lighting. Softly uplighting a tree in the backyard (if you have a backyard) is inexpensive, especially if you use a solar light, and expands the nighttime view. Great solution. However, if you did require privacy would you say that this blind is too sheer? grace: What?! Really? Wow, that is kind of weird. And yes, it’s a sign that you need to cut those shades this weekend! Beyond what I wrote in the post, the only other suggestion I would offer would be to remove the bottom rod first, measure the cut line on the top roller, then snip into the fabric horizontally up to the cut line. Then you’ll be able to fold the fabric back while you saw the top roller. Does that make sense? Jenn: I do have a garden, but our house is an attached row house on a city lot. Putting any kind of lighting in my backyard at night would be just plain evil to my neighbors! I had a downstairs neighbor in Brooklyn who had landscape lighting, and it was REALLY ANNOYING at night — we needed blackout shades to be able to sleep. jones: Yes, they are too sheer to really provide good privacy at night. Fine for the back of my house, but I wouldn’t use them on the street side on the first floor. oooh, i’m loving the lighting effects these shade create! great choice. Looks wonderful, Anna! I’m wondering if after you cut the width, do you need to bond the edges in some way? I’m glad I read Jenn’s comment as solar lights might be a good solution for our horrendous bare-window black holes. I’ve noticed how much nicer it looks inside at night if the (wasteful) porch lights are on. Speaking of IKEA, I just finished putting together the sofa and two chairs for our basement room – it was so easy! It was kind of satisfying to know exactly how they were made and assembled. They seem like sturdy pieces and the slipcovers fit perfectly, unlike the one for our Room & Board chair, which is too big and doesn’t have any velcro to keep it in place, like the IKEA ones. Does anyone know if it’s okay to wash the large sofa slipcover in a regular washing machine, or will it get too wrinkled? funny about the scissors. my mom is an textile artist. as i was growing up, we had box of scissors that my dad and i were forbidden to touch (not even LOOK, especially if I was looking for a scissor), even in the case of emergency. those were for her fabrics, and ONLY that! I wanted to buy these for our windows, but the widest ones IKEA makes are only 55″ and our windows are at least 70″ wide…if I could only turn them sideways! We ended up buying solar shades which cost $600 for 3 windows. Ridiculous. It might be easier to use a rotary cutter than a pair of scissors. You put it next to a straight edge and cut. I suggest cutting on the waste side. If you slip, no big deal. You could do a whole post on the virtues of the right scissors and correct equipment, how it makes project a 100% easier. My sister (a sewer extraordinaire) gave me a pair pair of beautiful fabric scissors for a birthday gift. wow, makes me want to switch out the disgusting blinds that came with our house. mommy: Nope, no need to bond the edge! The fabric feels like it already has some kind of coating on it. There’s NO fraying at all. As for the slipcover, I used to put the one for my old IKEA sofa (cotton/poly blend) in the washing machine with no problem, but I don’t know about the 100% cotton ones. I would imagine if you take it out right away and hang to dry it would be fine, especially since it gets stretched so tightly around the body of the sofa. Ricky: You’d need a pretty gigantic cutting table in order to make the rotary cutter useful though, right? The shades are 98″ long. I’ve never used a rotary cutter before, but don’t you have to have a stable surface underneath? I’m glad that I’m not the only one who finds the “reflective black hole” effect creepy. Although I actually have a fear of it that dates back to my childhood. I feel really grown up when I’m afraid to go in a room alone because of it. Hi, really love your blog. I had a question; where did you get that white floor lamp in your living room? alex: Thanks! I bought the lamp at West Elm several years ago — unfortunately, they don’t carry it any longer. very cool idea. We also don’t have custom windows. Thanks for the great tip! Last time I was at IKEA, I saw these shades and thought I should get them for our place. I really liked the metal “rod” at the bottom and the chain. I could just buy them and try them but our closes IKEA is 2.5 hours away and I’m not up for multiple trips. Tatyana: Yes, they would give you privacy during the day (unless you were right next to the window), absolutely. At night you can see through if the lights are on. Have you considered using frosting film on your windows? We used it in both of our bathrooms, and it provides very good privacy while still letting in full, diffused light. Yes, you do need a stable surface, but it could be a table, a countertop, or even the floor. You also need a cutting board, preferably a self healing board. Just mark as you did for using a scissor, then line the straight edge up and cut. Keep moving the straight edge along the line, folding and unfolding the length of fabric as you go. Once you get use to the the rotary cutter, it’s really easy to get great results. I can’t wait to own a house where I can do whatever I want to. I think I’m going to get the same blind you did only for the bathroom for now. I can always have another excuse to go to IKEA to get the rest. Thanks for the reply. good to know. window coverings are so tricky. Those blinds are sheer, I guess. I used to have them in my Brooklyn kitchen and still walked around in my underwear. I was neither pelted, nor was there a crowd gathering, so it couldn’t have been that bad? I loved those blinds! Wish they were super wide for my super large windows in the ‘burbs. First off – your site is amazing. You are a total home-design inspiration. I love these blinds! I have them in 2 windows (where they almost fit): I love how they disappear when they’re not in use, and provide a soft filter when down. I’ve wanted them on a few of my other 100-year old windows, but haven’t felt the gumption to try altering them. One question – how did you remove & reattach the bottom rod? The rod from the shades I that got about 5 years ago do not seem to come off. Thanks again for all these awesome posts! Hi – have kept this post as “new” in my RSS feed for forever as I knew I would get to it at some point. Am having the same issue as Kristin, above – any tips on how to remove and re-attach the bottom rod? have fiddled a bit and can’t find a an easy solution. any tips would be great. thanks!! Jennifer, just pull the end cap off and the the shade will slide right out of the rod. Anna – thank you! I think was so afraid of breaking that I just wasn’t pulling hard enough/at the right angle. Success – pieces apart, will cut tomorrow. 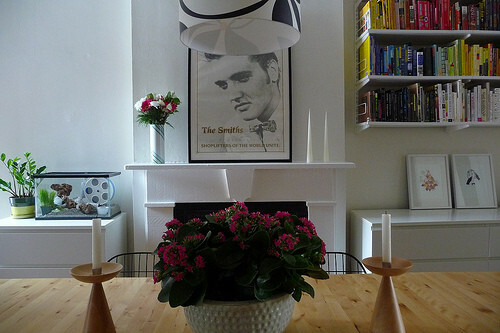 On a side note – also love your blog for the Morrissey entries! very informative blog post! I have been looking for economical roller shades…..did you use a hacksaw? btw-how was the Furs show? I used a metal-cutting blade on a circular saw, but a hacksaw would work just fine. Furs = awesome as always! Still haven’t gotten it together to custom size these (I commented way back in April — LA-ZY! ), but I’m planning to try it this week: new neighbors just moved into the apartment 10 feet away, and I need to be a bit more neighborly. Thank you for all your awesomeness! I love the look of these blinds too– but I also have a window that is too wide. That got me thinking though– do you think that you could put multiple blinds on one rod? IKEA’s online pictures aren’t great so I can’t really see the cord mechanisms… but could it be tweaked? And could it be done so that each could still operate independently? I hope this is not a silly question: what is the brand/model of your fabric shears? I am moving to my new place soon & need 8-10 Enje blinds for the whole house. I am a person out of DIY technique and hope a gd pair of scissors could save me from hell. I know you heard it many times before, but I still want to say: I LOVE LOVE LOVE your house (esp the white painted wood floors). so far, i have hung 5 of these shades & only two actually rollup the way they are supposed to. the other three somehow have become “sprung” or something. I like the way they look once up, but i hate the way they work, which is not. I have had these blinds in the back of my mind for years – probably since you or Morgan first posted about them way back when, and now I have windows where they make sense/I need some semblance of privacy – except my windows are way too wide…. The windows are each 3 panes wide, so I am thinking maybe I can do 2 blinds per window (1/3rd, 2/3rds). I am wondering how bulky is the attaching mechanism? Do you think they would work side by side, or would there be a huge gap between them? Another option might be to use the rolling mechanism and custom width rods and fabric? I just purchased a house that still had these roller shades. Some of the shade material has detached or shredded away from the bottom rod. I would like to cut this part away and replace bottom rod. Might you suggest how I could do this. Not sure best way to get shade back in rod.